With the drought officially over and the summer heat upon us, people all across California are heading outdoors. For many, that means a day on the river or relaxing by the lake. The wet winter means there’s plenty of habitat for one of nature’s most curious creatures. Water striders, also called pond skaters, seem to defy gravity. You’ve probably seen them flittering across the water’s surface, dodging ripples as they patrol streams and quiet backwater eddies. Scientists like David Hu at Georgia Institute of Technology study how water striders move and how they make their living as predators lurking on the water’s surface. It’s an amazing combination of biology and physics best understood by looking up close. Very close. Water striders are insects with six legs. They use the front and back legs to hold themselves up and the middle pair to row. “They’re basically like little rowboats,” said Hu. But unlike the oars of a rowboat, water striders’ legs don’t penetrate the surface of the water. 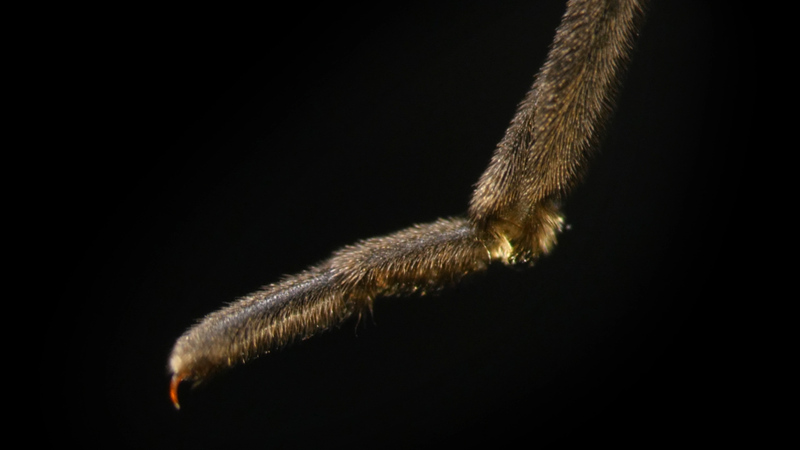 That’s because water striders are covered with tiny hairs that repel water, trapping a layer of air next to the strider’s legs and body. That buoyant air keeps the legs from breaking the water’s surface and makes the striders bob back up if they get swamped by a tiny wave. The weight of the strider pushing down on the water causes the surface to deform—but not so much that it breaks. Instead, the water dimples. Hu has studied the way striders move by filming them in dishes of water in his lab at Georgia Tech. The researchers dyed water with food coloring to reveal how striders disturb the water as they row. Hu found that striders move by pushing against the walls of the dimples of water. “They use the water to push on more water,” he said. That’s how striders scramble across the nearly frictionless surface of the water. They can even leap off the water in order to dodge attacks from below. The hairs create so much buoyancy that it’s very difficult for water striders to dive. That’s important because the females protect their eggs by laying them under submerged rocks or tree branches. This ability to “walk” on water gives striders an incredible advantage over creatures that can’t. What looks like a gently babbling brook to us is a deathtrap to most insects. For something the size of a fly, water is very sticky. Those that can’t free themselves from the grip of the surface tension quickly become exhausted by the struggle. That’s exactly what what water striders look for. And to them, the vibrations caused by a cricket or moth struggling to swim sound like a dinner bell. The striders wait for their prey to float by and then bolt out from the stream's edge to collect their prize. They grab hold with their front legs and use their piercing needle-like mouth to stab into their victim and squirt in digestive enzymes that pre-digest the meal. Moving across the stream requires agility and effort, so striders typically hang onto the side of the riverbank to rest between meals or when they feel threatened. For water striders, keeping their feet dry certainly gives them the upper hand.